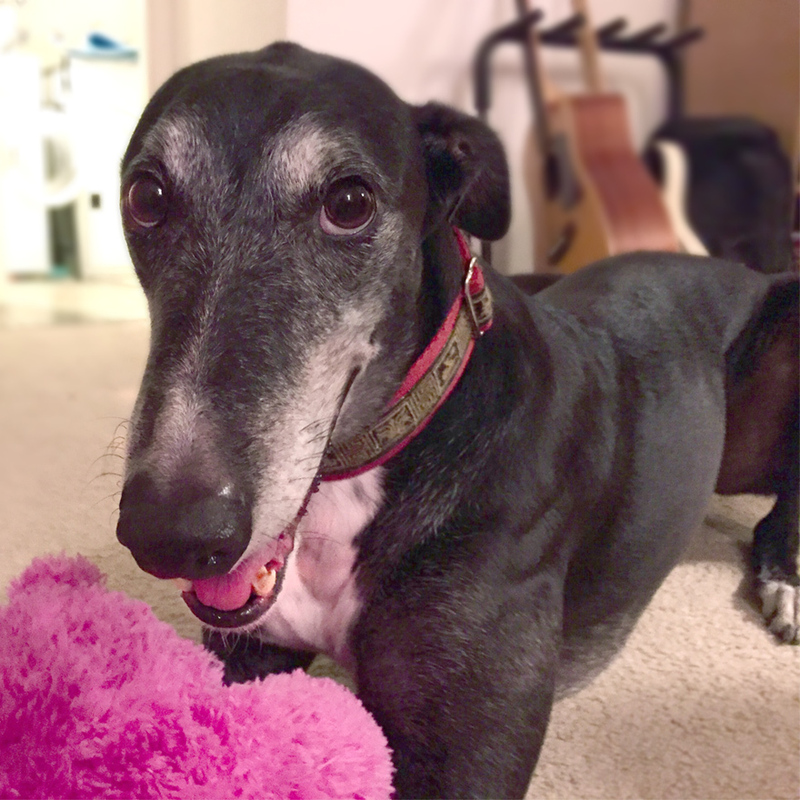 Ollie, the six-toothed senior greyhound, has a penchant for stealing socks, slippers and hearts and found a loving home with Ashley and Tom in the nation’s capital. It might seem like an unusual pairing - a young couple, and a senior ex-racing greyhound. 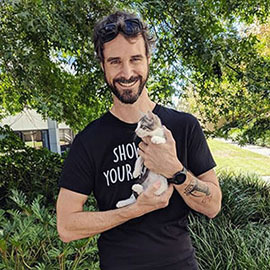 But for Ashley and Tom, who live in an apartment and work full-time, adopting Ollie has worked out to be a winning fit with their lifestyle. “We'd been wanting to adopt a dog for a few years. But we were feeling a bit unsure about it, given that we live in an apartment and we're renting,” explained Ashley. “After doing some research, we discovered that greyhounds are actually great apartment dogs. They don't actually require that much exercise, and they are one of the few breeds of dogs that we've come across that rarely bark, which was important for us renting an apartment. Ashley and Tom got in contact with the team at Greyhound Rescue, who pointed the pair in the direction of Ollie, an eight-year-old greyhound who had been in foster care for about a year. “Ollie seemed like he had a kind soul. He's an older dog with grey around his face, and he was missing a number of teeth. But he looked very sweet and lovely,” Ashley said. They arranged a meet and greet at the foster carer’s home. Ollie immediately came over for a pat, bringing a pair of socks to play with. “We took him for a short walk and he seemed quite energetic for his age. He was very friendly and a bit cheeky, so we liked him already,” Ashley said. Won over by Ollie’s sweet nature, Ashley and Tom went ahead and adopted the gap-toothed greyhound. 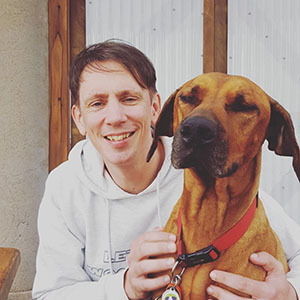 “Ollie's foster carer dropped him off at our house on a Friday evening, and Tom and I were excitedly counting down the hours at work that day! 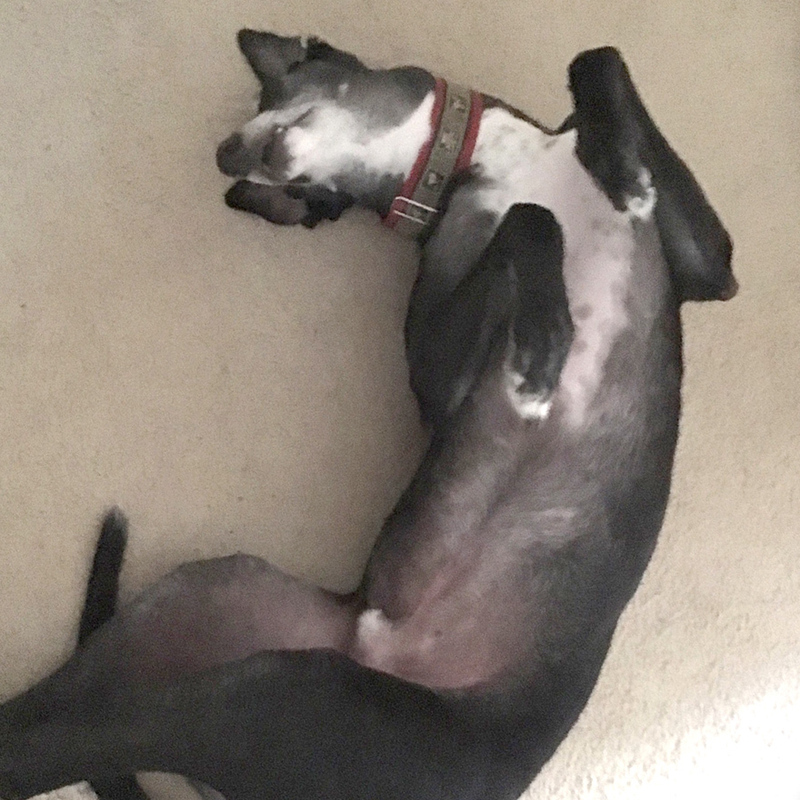 When he arrived, he happily explored the apartment and almost immediately started roaching on the floor - lying on his back, legs up in the air, a sign of a happy greyhound,” Ashley said. It’s a far cry from the racetrack and the pound, where Ollie found himself at the end of his career. Ollie has brought lots of love to his new home, and some great lifestyle benefits too. “Each morning, our lives mostly revolved around getting ready for work. Since we've adopted Ollie, we've made time to go for a walk together in the morning, all three of us. It's been really nice because it's a bit like a 'family outing' of sorts,” Ashley said. “When we arrive home from work, one of the first things he will do (after excitedly greeting us at the door) is grab one of his toys and start playing with it, as if to show us what he's been doing. This will only last about 30 seconds before he eventually lies down for a rest. “He knows when it's time for bed. He will see Tom and I getting ready, so he will dutifully move to his bed in our bedroom, sometimes snuggling up with his pink teddy. “Our lives have definitely changed for the better. I also think Ollie has made me a more patient person - particularly when he decides to lie down in front of a doorway and refuses to get up again!” Ashley laughed. Are you ready to adopt a senior dog? Here’s how to start your search. Click this link to view the list of senior dogs currently available for adoption on PetRescue. Select your state. Enter your postcode. Select your gender and size preferences and use the filters to enter basic info about your home. Best of luck finding an older new best friend.